San Luis Potosi has never received as much attention as its famous neighbors, Guanajuato and Zacatecas, both of which are UNESCO World Heritage sites. But this situation could change in 2010, when it is likely that San Luis Potosi will also be added to the prestigious UNESCO World Heritage List. True, San Luis Potosi doesn’t overwhelm your senses with spectacular architecture the way some of Mexico’s Spanish colonial cities do, rather its beauty lies in the details: ornate iron balconies, neoclassical doorways, and understated facades decorated with intricate crests and scrollwork reveal themselves as you wander its orderly grid of streets. The Spanish founded San Luis Potosi in 1592 after they discovered gold and silver at Cerro de San Pedro in the nearby mountains. San Luis soon became one of the most important and wealthiest cities in New Spain and a major stop on the Camino Real or Royal Road, along which silver and gold were transported from Zacatecas south to coffers in Mexico City. San Luis Potosi is organized around six plazas, each with its own personality and unique blend of architectural styles representing four centuries of building sprees. At the heart of the historical center lies the sprawling Plaza de Armas with its 17th-century baroque cathedral, and somber-looking Palacio Municipal and Palacio de Gobierno, both dating back to the 19th century. The 17th-century Edifico de la Antigua Caja Real or Old Royal Treasury Building near the Plaza de Armas is currently being restored to help meet part of the requirements outlined by the UNESCO World Heritage Committee during its 33rd session that was held in Seville, Spain, in June 2009. It is now anticipated that the UNESCO committee will inscribe San Luis Potosi on the World Heritage list during its 34th session in 2010. 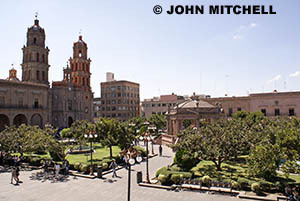 Hi people, Im from San Luis Potosi and I could tell you that you need to come if you want to get a good vacation, our city is full of lovely places, we are here waiting for you, come and enjoy Plaza del Carmen, Plaza de Armas, Aranzazu Plaza, Calzada de Guadalupe, and all of the potosinian architect. San Luis Potosi,Lovely city, nice people, excellent weather and you can enjoy their traditional dishes, Enchiladas Potosinas, Pozole,tamales huastecos and Chocolates costanzo.